Most of us are familiar with the important social justice issues of the 19th century, causes like abolition and child labor. 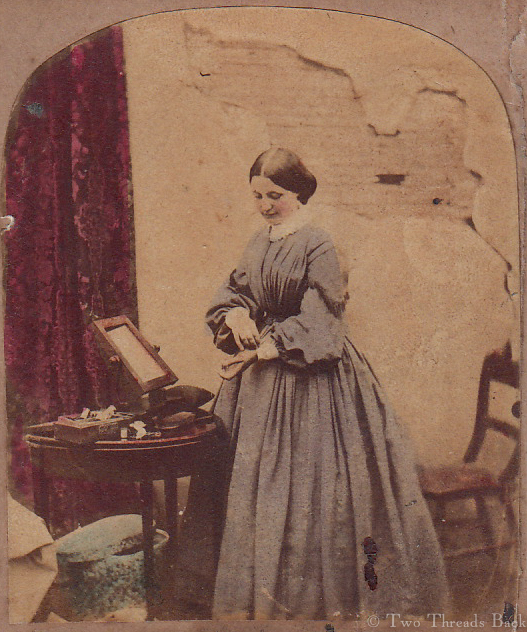 But there was another one that became quite fashionable to champion: the plight of workers who fashioned fashions. 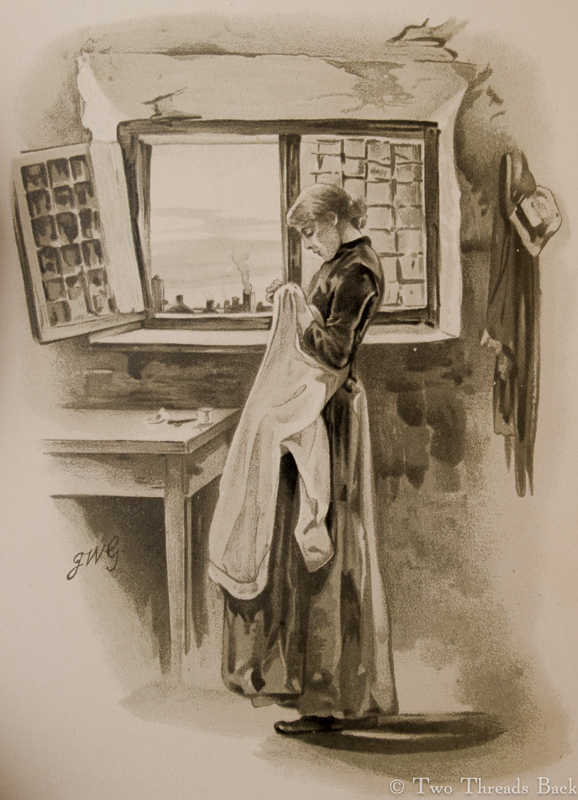 Women who worked as seamstresses, dressmakers, and milliners were vulnerable to exploitation, and as the pathos and romance of their situation caught public fancy, there was a flurry of response in literature, art, “committees,” laws, private philanthropy and even investigative journalism. The seamstress who sewed shirts was the poster-child for the cause; you can see one period image I used in a post a few years ago here. 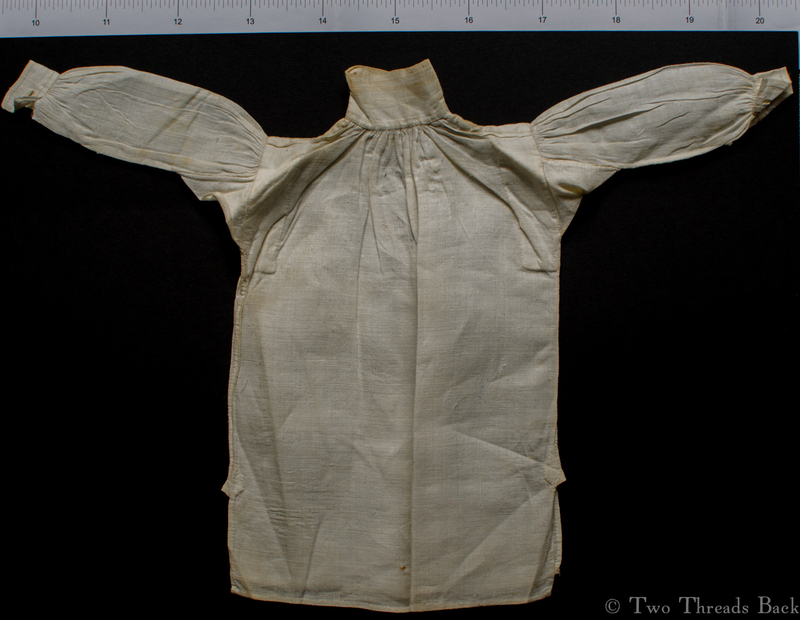 Shirt-making was tedious and poorly paid, but the pattern was simple and most of the women who could sew knew how to make one. There was also a steady market for the product, at least until the sewing machine and mass production made hand sewn shirts obsolete. Dressmaking was different. 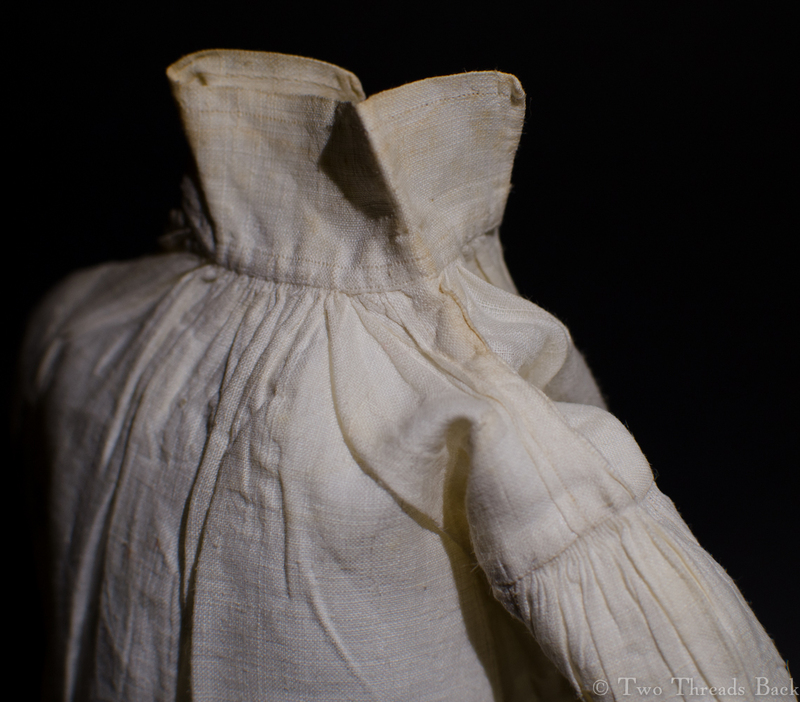 It required greater skill and was more susceptible to the whim of the patron (and employer if a woman worked for a dressmaking establishment) and vagaries of the trade. But it retained some shreds of respectability as a way to earn a living for those women who were not born to the working class, and yet found themselves with no means of support. 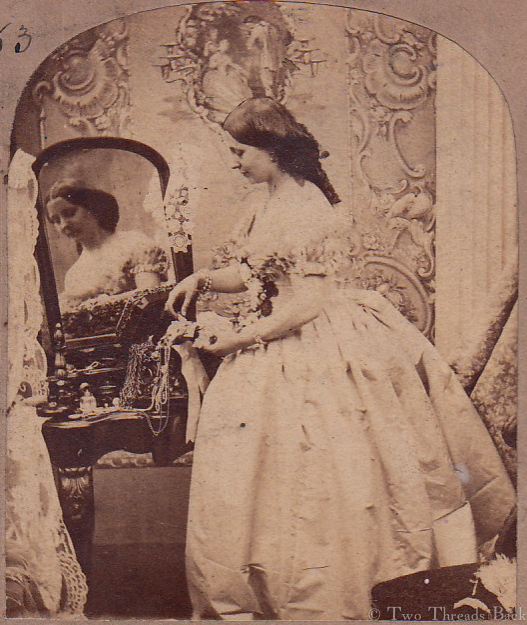 The images here are from a set of stereoviews, the one above titled “Pin Money,” with the model carelessly displaying her wealth of finery. 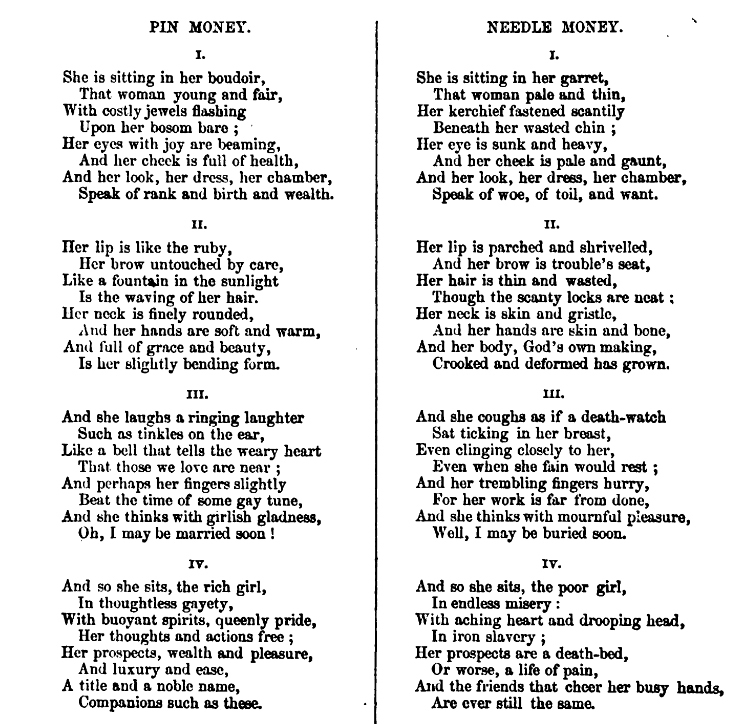 The other is called “Needle Money,” implying that the plainly dressed lady in shabby surroundings must be earning her bread with her needle. * These two poems are printed, as written by the author, in juxtaposition, to make the contrast more striking. I haven’t copied the whole poem, since the point and tone are pretty obvious. Victoria was reigning, but so was sentimentality! Many bloggers have covered the subject, so if you’re interested try a search for “song of the shirt” – it will get you started. If you prefer the old-fashioned-read-a-book way, try The Ghost in the Looking Glass, by Christina Walker – not recent, but fascinating! Notice anything about the models? Sadly, the days of sweatshops aren’t gone forever. If you want to help, here’s one place to start. The Dorset Button! Not the more common flat disk with thread spokes, but a “high top,” a tiny sphere wrapped in a spider’s web of thread. I mentioned in the Love Shirt post that I would explain how I made the buttons for the shirt – a non-documented, unauthenticated version for the directionally challenged: me. 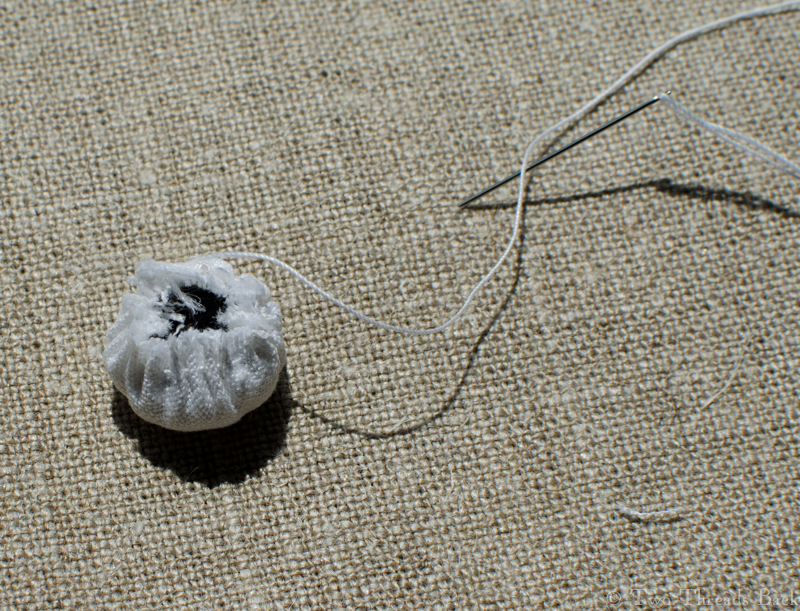 Believe me, before I finished the trial button, it did look more like a Dorset Knot. But I persevered. The originals I wanted to copy are pictured above. They seemed to be stuffed with a kind of fiber, but the base was a black substance with a greenish-yellow cast and waxy look. It had puzzled me for years. 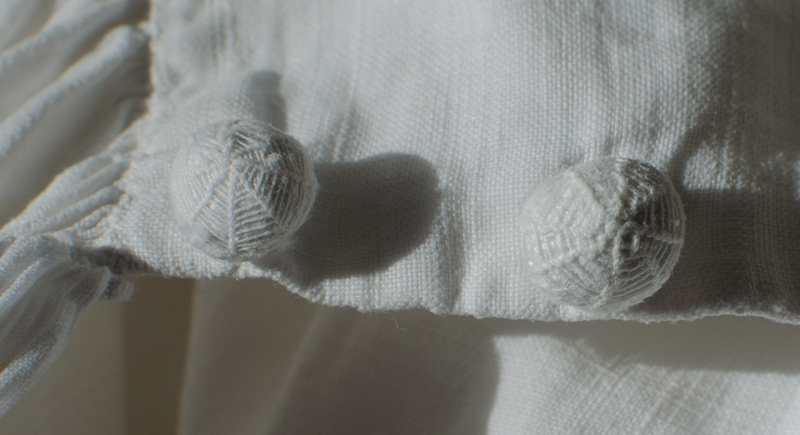 Then after reading about Dorset Knobs in 50 Heirloom Buttons to Make (you want this book! ), I realized they must be made of horn. 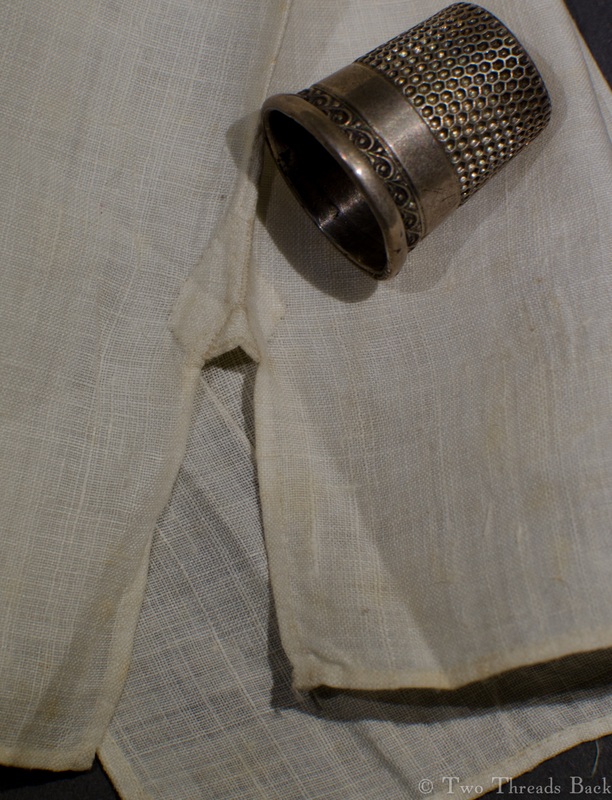 You can see the horn button base on the original. 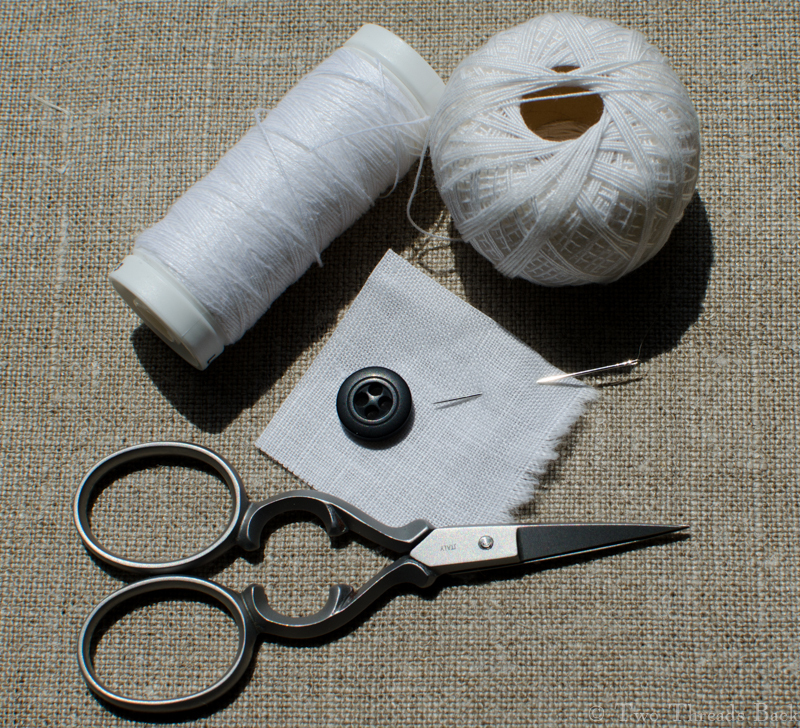 Next I ran a gathering stitch around the circle, put the scraps in the center with the flat button on top, pulled the gathers tight, and stitched them closed. Voilà! The mold! 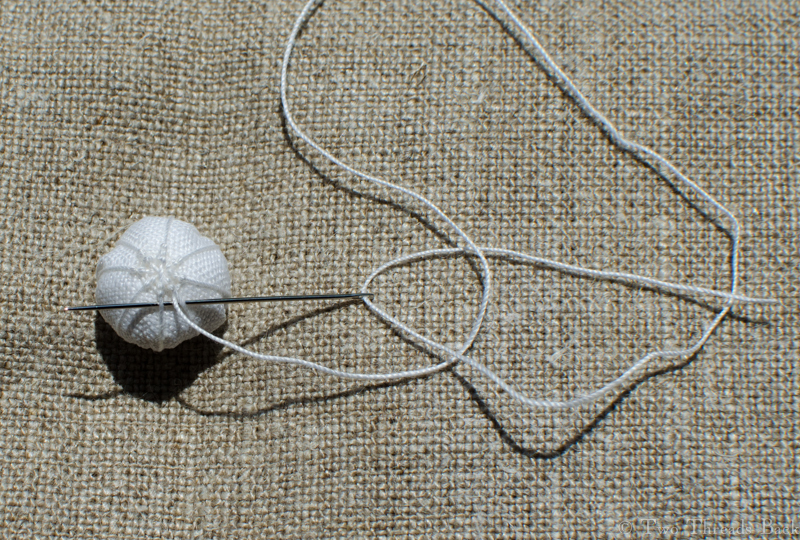 Then I wrapped thread around the button in a compass rose pattern and anchored it. 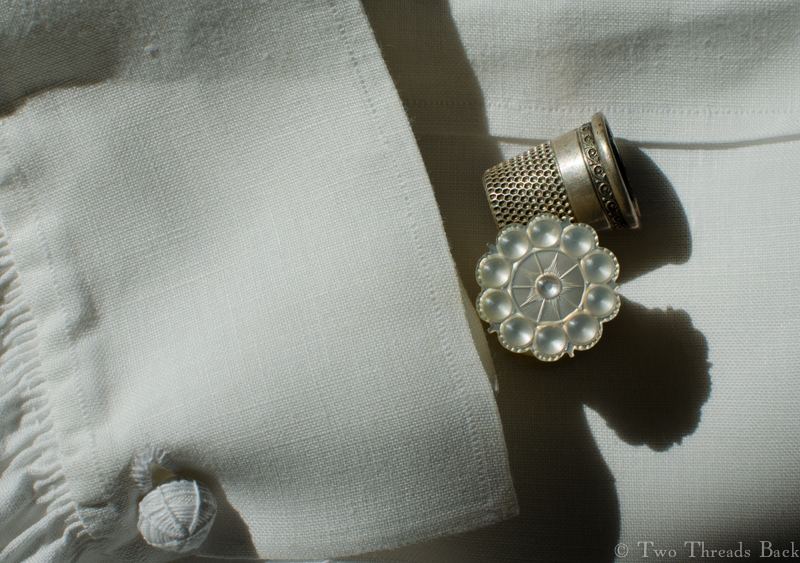 Beginning at the top, I circumnavigated the button, taking a backstitch around each “spoke” and moving on to the next. It was a bit fiddly, having to smush the lumpiness of the mold and realign the spokes as I worked toward the base. 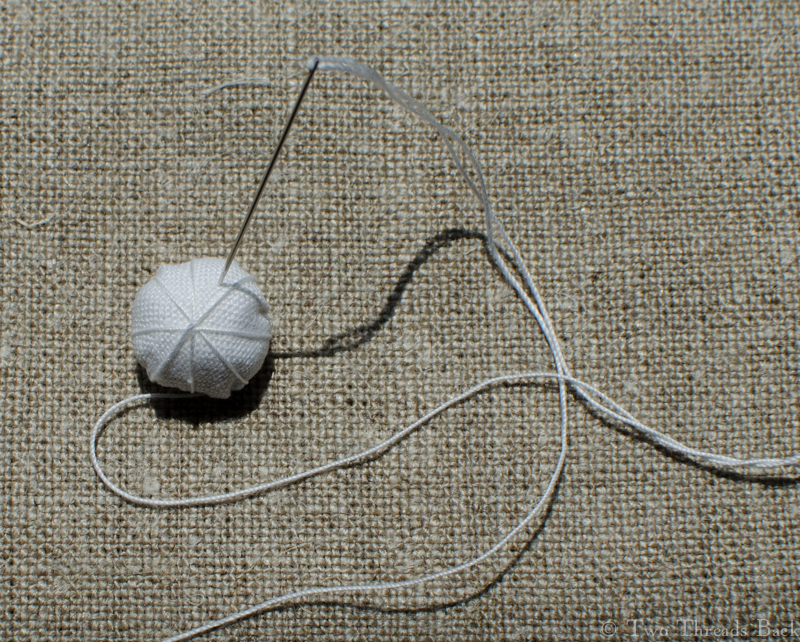 Once I had made a final pass around the base, I took a few stitches to anchor it all. And then I had to make four more. For those who like pictures better, see below. For those who want a more authentic method, see the book mentioned above. And for everyone else… well, there’s always velcro. All you need to make a Dorset Knob Button. That’s a Bohin needle by the way, my new most fave! Thread laced in spokes around the mold. Circumnavigating the globe: backstitching around each spoke before going on to the next. Or back one, forward two. Ta da! 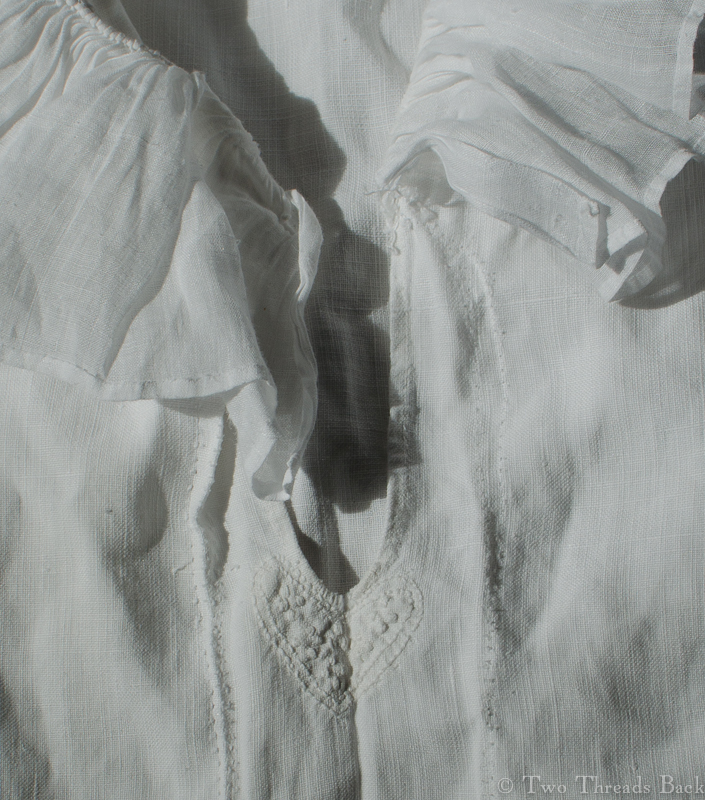 After ten grueling years (ok, I don’t really know how long, but it has been years) I finally finished a 19th century gentleman’s square-cut shirt of fine linen. 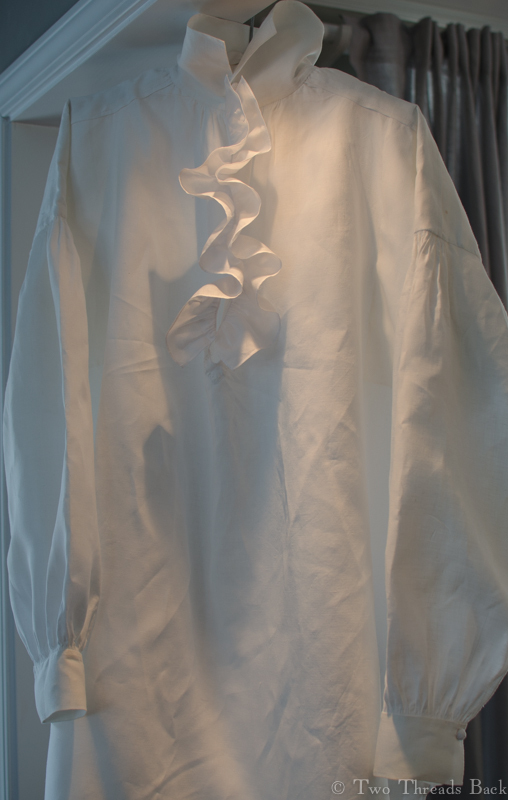 Complete with all twenty parts, including the frill. And Dorset knob buttons. Where did the name come from? Well, a long time ago a friend and I (I miss you, Janet!) 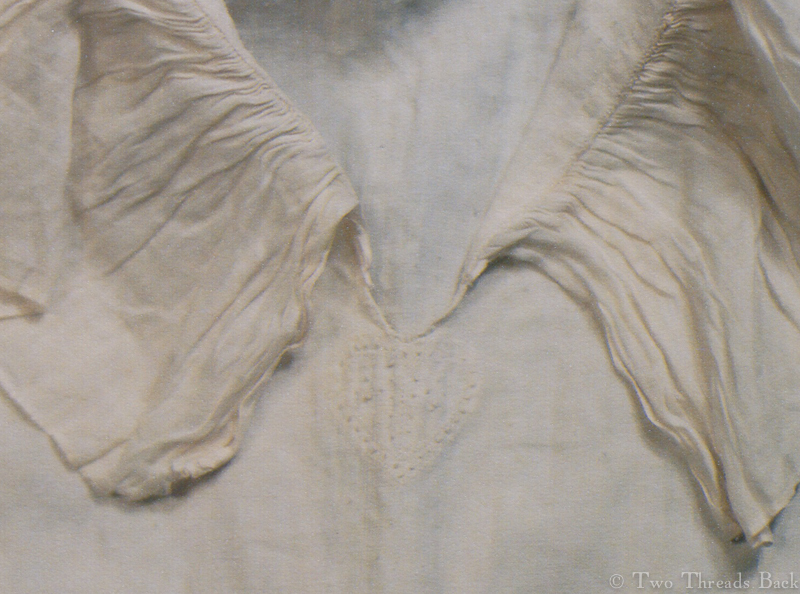 were studying one of these shirts, one that had a heart-bit (see that blog). We reached frantically for our vinaigrettes, trying not to swoon on the artifact, as visions of Mr. Darcy flitted around the room. Somehow we started calling that handsome relic The Love Shirt. So it has been to me, ever since. And I wanted to make one myself. 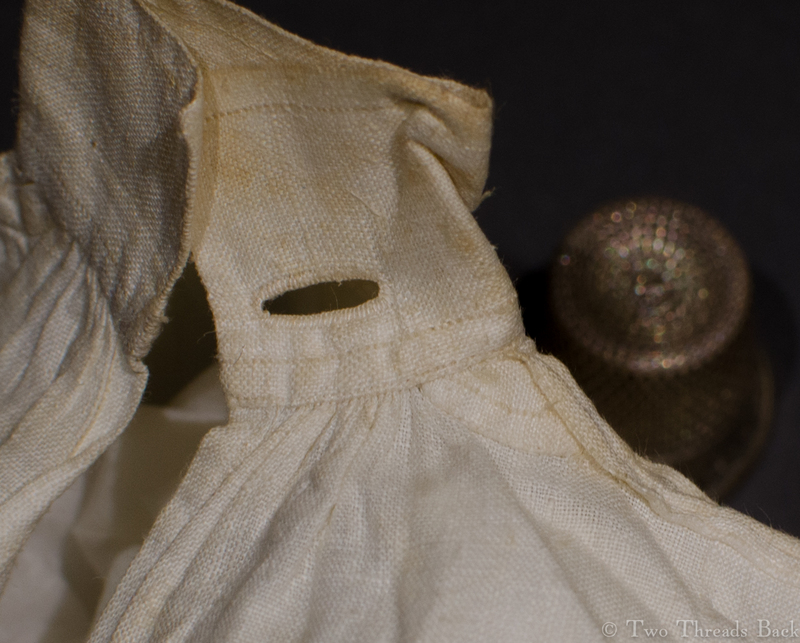 That type of linen is impossible to find nowadays. However, a dear friend (thanks, Dianne!) provided the closest thing possible, and with a pattern from an 1820 book, I commenced. Darned little gussets, all the work I did backstitching was mostly hidden when assembled. Unfortunately I have a memory like Dory, so every time I put away the project for a spell, I’d have to practically learn how to do the next step all over. A 19th century seamstress would have been appalled to see me. Um, do I sew both ends of XYZ before I ABC? Do I cut or fold first? Did I sew the sleeve on backwards? Oops. Front and back are the same before the collar goes on, right? Not if you hemmed them first. Oh right, I was supposed to check that I was putting the slit in the front. Well… I’ll just cut the back shorter and make it be the front. And my g-g-g-g-great-grandmother could make one of these in a day or so? How embarrassing. I did learn a lot. I learned how hard it is to backstitch over two threads without going blind. I learned that there is NO not-shiny sewing thread available today. 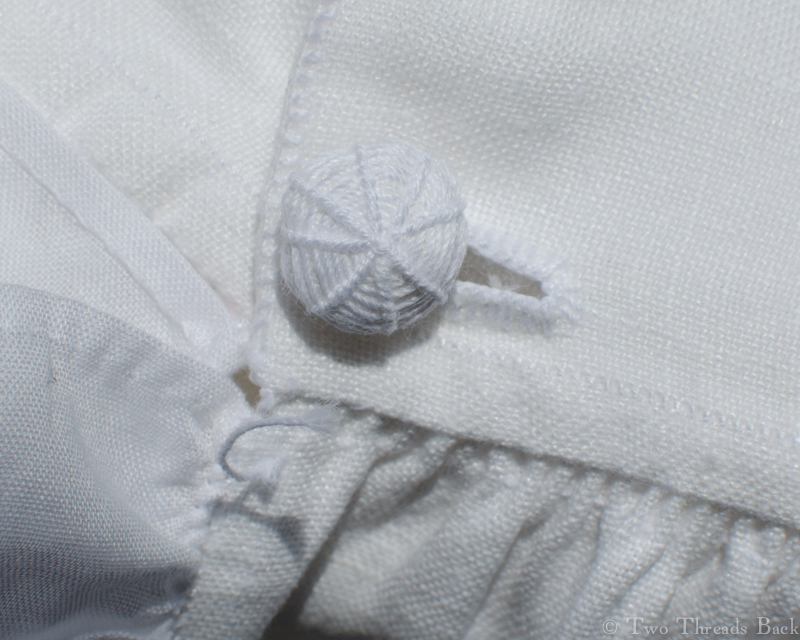 I learned that linen thread breaks, other people’s buttonholes always look nicer than mine, knots are usually unnecessary, even poor work looks better when ironed, and a drawn thread is no guarantee you’ll sew a straight line. I learned that you had to love your man, or love survival to make one of these. And I learned how to make Dorset knob buttons, my own way! Maybe I’ll write about that next time. You can see the backstitching that nearly blinded me. And you can see the gauging thread I used to hold the stroked gathers in place. I’m going to leave it there a loooong time. Fortunately my garret has a window. 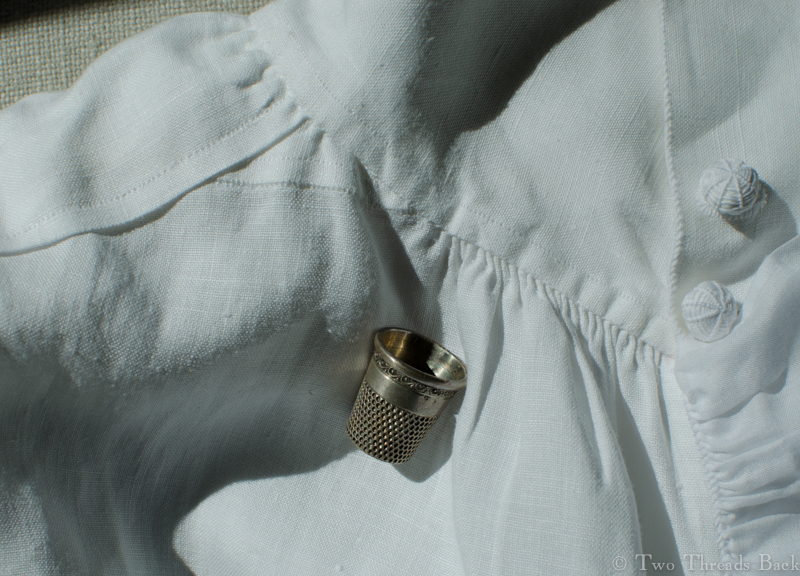 In spite of my plain shirt obsession, it took me forever to finally reproduce one myself. I have a tendency to procrastinate, and it doesn’t seem to matter if it’s something I really love or not. I’ll start with enthusiasm, and then the motivation fizzles and the project goes on the UFO shelf. 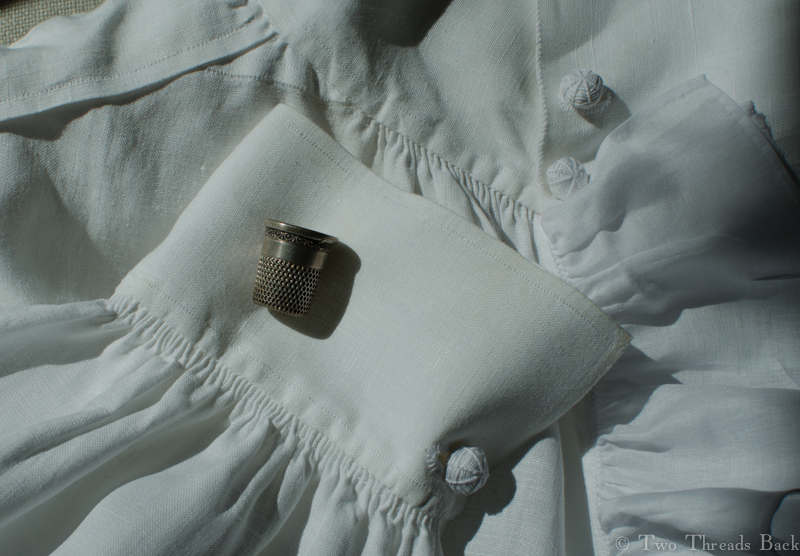 So it’s been with the fine linen shirt I’ve been playing with for the proverbial seven years. 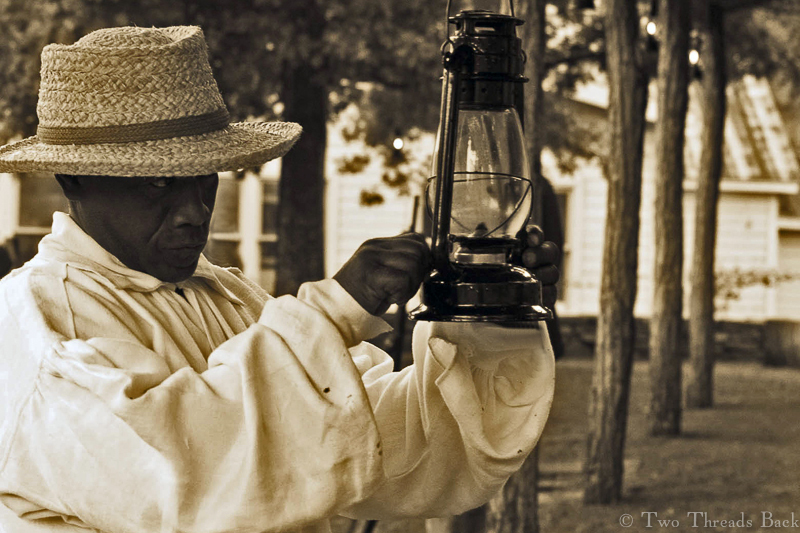 But then last year I had to make one for a local history event, and a Deadline With People Waiting On Me provided the necessary spark. 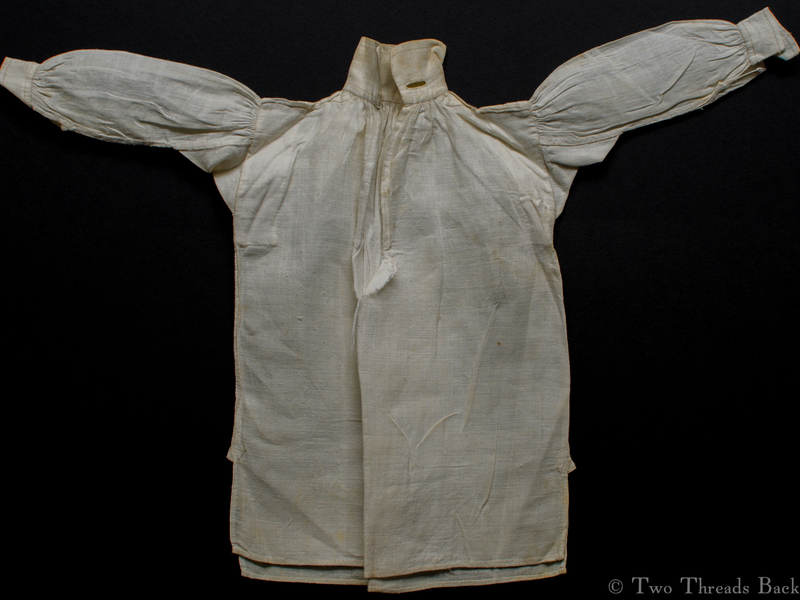 This square-cut shirt wasn’t made of fine fabric, but of worn-out linen, since it was to dress an interpreter at a historic slave cabin. 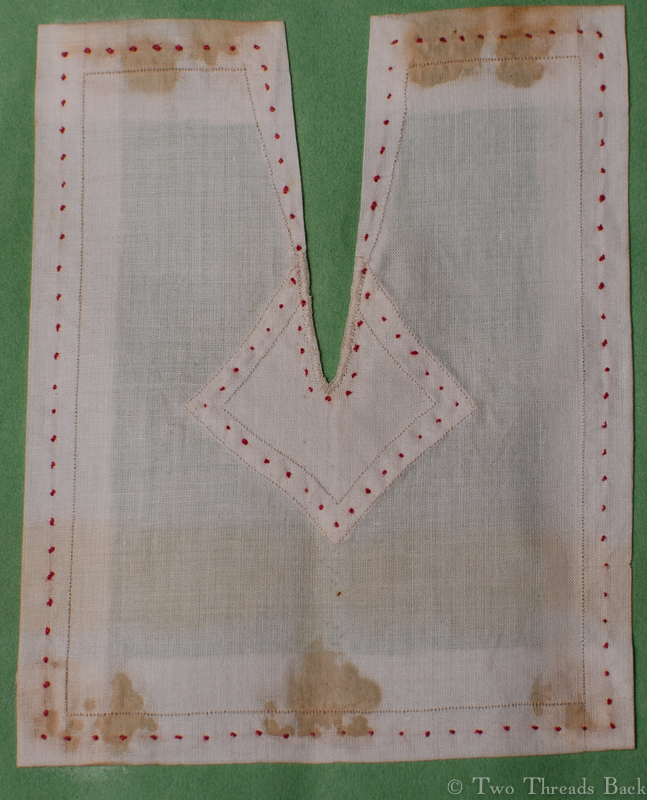 It was easier to do since I was replicating an old and tattered garment: all my stitches didn’t have to be perfect, thread could be mismatched, patches were expected. 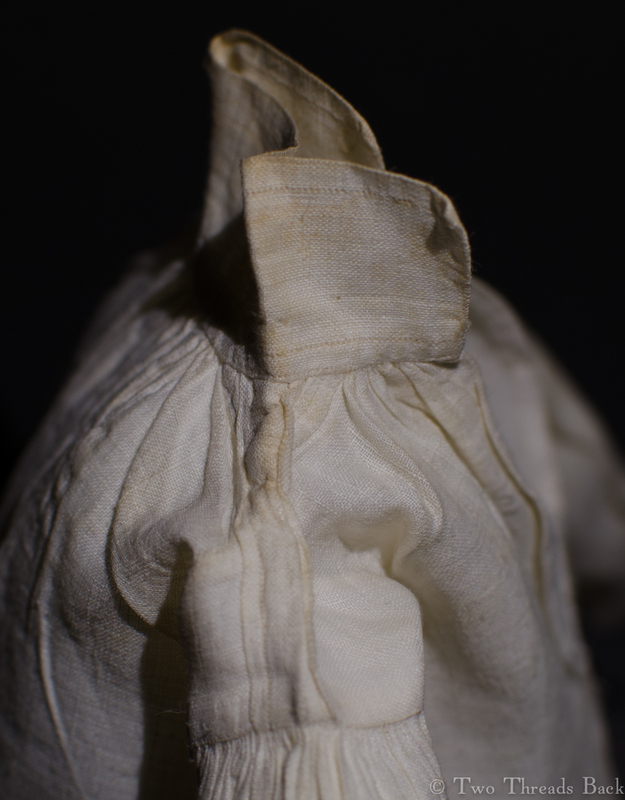 The hard part was working on a heavier material that still contained prehistoric starch, as well as making the shabby parts fit the pattern in the right places. 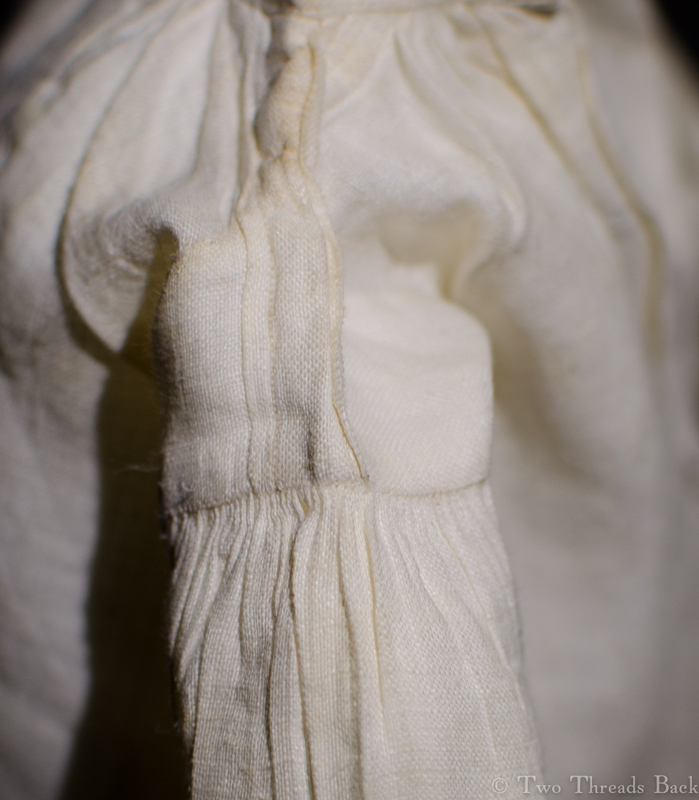 Working over two threads on lumpy and uneven material made the finished product look a bit coarse. Um, not my fault… right. However, I made the deadline although both the shirt and I were worn out! Exhausted from an all-night binge of shirt-making. Just when I get complacent, thinking I’ve found a bit of information and can safely pack it away, something comes along to surprise me. As Seen on TV advertising is not new to our generation. Well, maybe the TV part, but not the advertising! 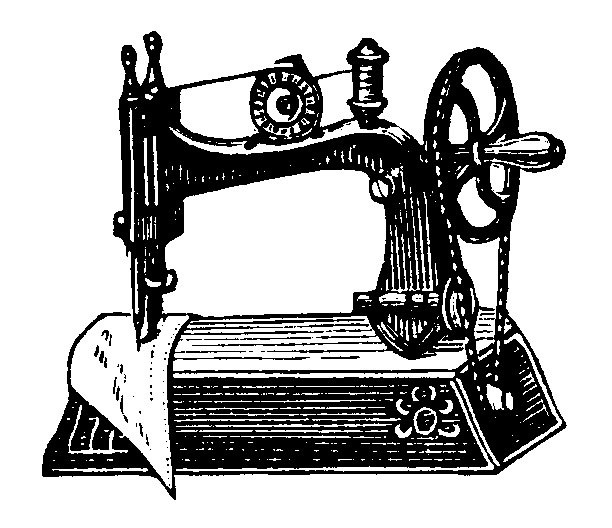 About 150 years ago readers of Godey’s Lady’s Book were told how much easier their lives would be if they only had that new invention, The Sewing Machine. In true journalistic tradition, Harper’s presented, almost word for word, the same thing in 1869. Only their math was a little different. 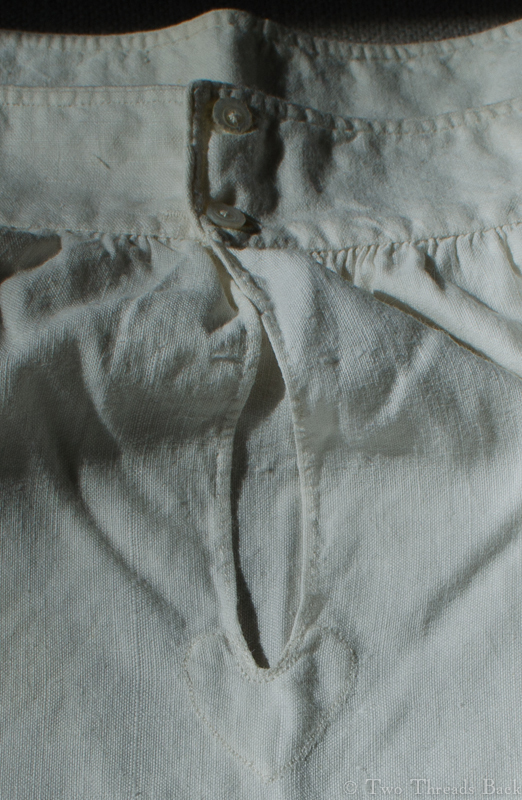 The following curious calculation of the number of stitches in a shirt, which somebody has had the patience to make, we mean the calculation, not the shirt, by any means, may induce some gentleman to present his wife with a good sewing machine. 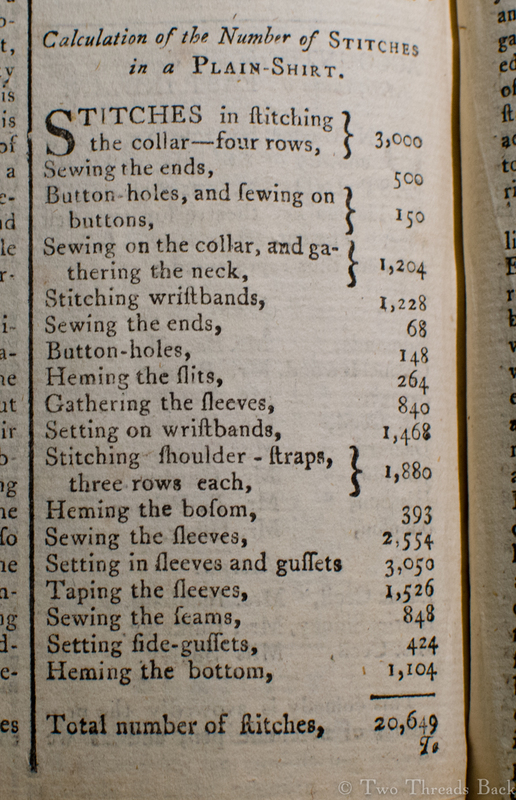 Stitching the collar, four rows, 3000; sewing the ends, 500; buttonholes and sewing on buttons, 150; sewing the collar and gathering the neck, 1204; stitching wristbands, 1228; sewing the ends, 68; buttonholes, 48; hemming the slits, 264; gathering the sleeves, 840; setting on wristbands, 1468; stitching on shoulder straps, three rows each, 1880; hemming the bosom, 393; sewing the sleeves 2335; setting in sleeves and gussets, 3050; tapping the sleeves, 1526; sewing the seams, 848; setting side gussets in, 424; hemming the bottom, 1104. 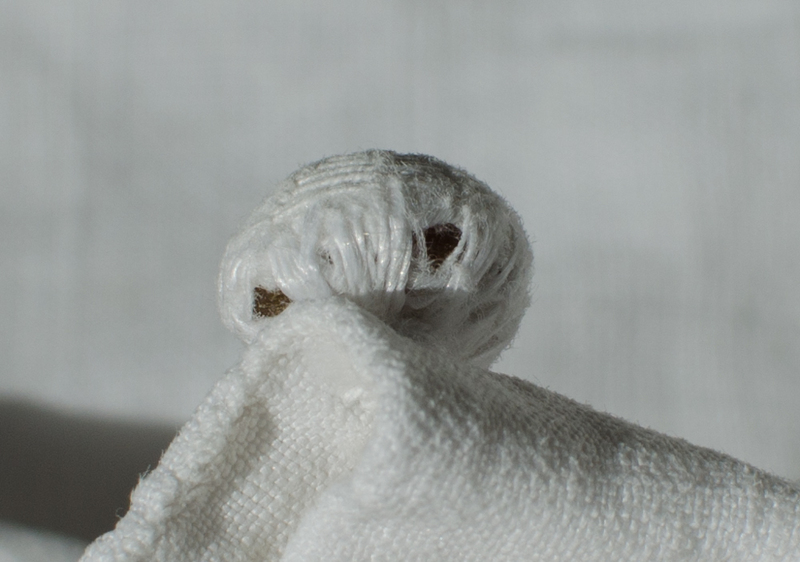 Total number of stitches 20,530. It was great fun tracing the path of these “curious and significant” calculations, although a bit confusing because sometimes a publisher would acknowledge the source (quite helpful), sometimes not (greater challenge), and sometimes it was a reprint from their own magazine (I got lost). Not to mention, their math could be as wobbly as mine! 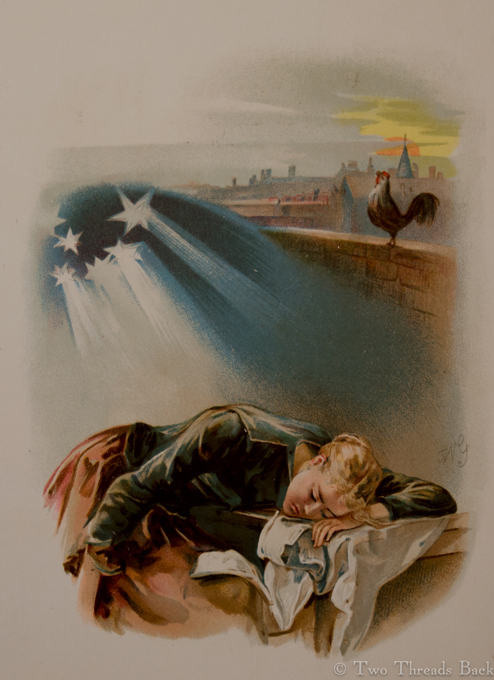 The trail of the tale was pretty typical for 19th century publishing. However, I was astonished to finally come across the same calculation in another magazine – from 1782! So this stitchery factoid was much older than I had supposed, even more exciting! As a plain-sewing-square-cut-shirt devotee, I’m fairly familiar with the terms used in their construction. 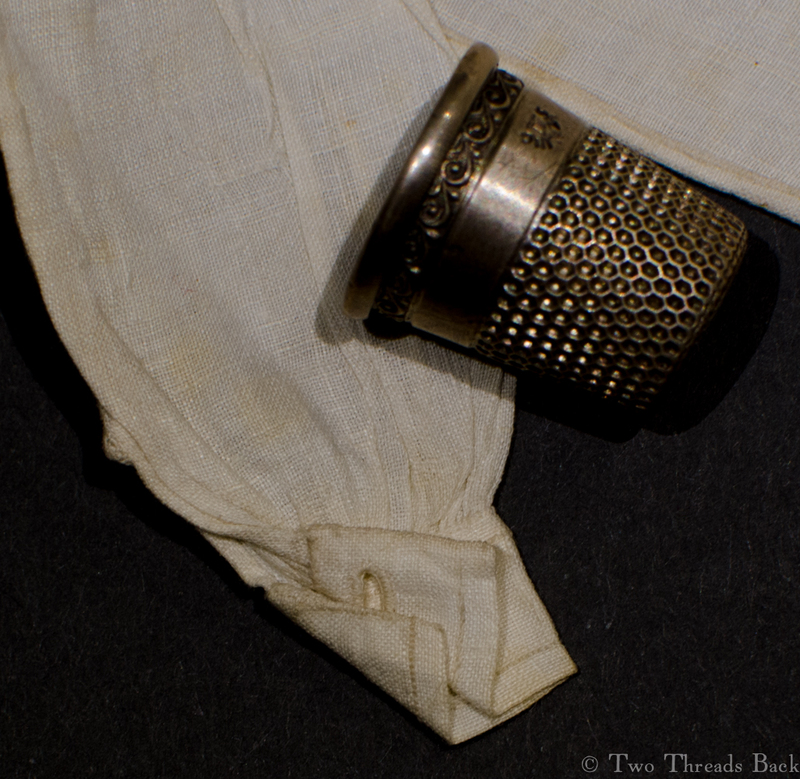 I know about the “nineteen pieces in a shirt, twenty in a trimmed one.” But I was puzzled by “tapping the sleeves.” After finding the other versions I assumed it was a typo for “taping.” And behold! In The Lady’s Magazine, the word was clearly ‘taping’ – but what did it mean? 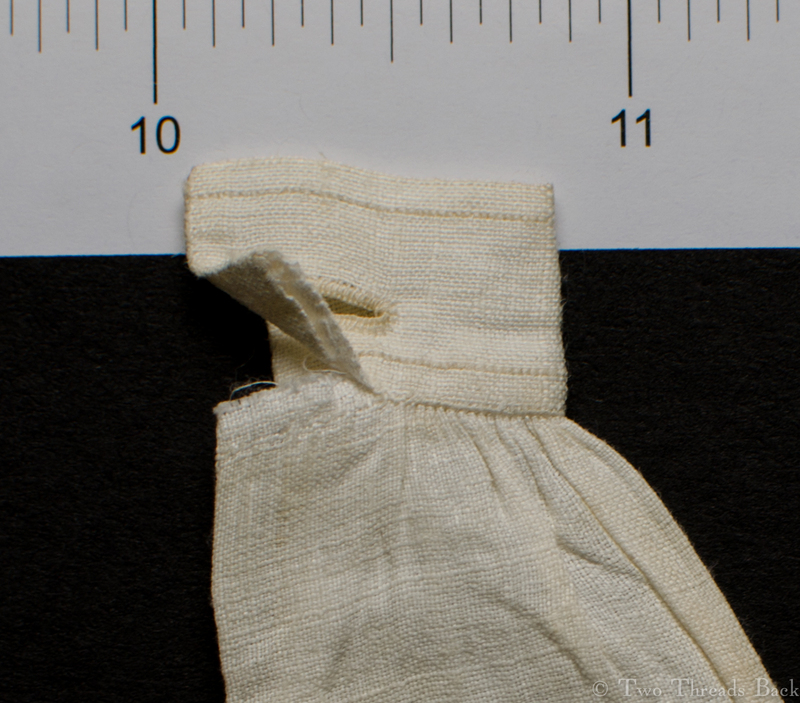 Tapes in the early garments were usually what we call drawstrings today. Hmm… Ideas, anyone?